Suitability: Adults and students from 15 years+. Piano students must be able to play piano to Grade 1 level and read music. JULIE MASON is one of New Zealand’s foremost women in Jazz. She has performed as JAZZ PIANIST/VOCALIST at Jazz Festivals and Clubs throughout Australasia, as well as Europe, Asia, The USA, and the South Pacific. She has released six albums as bandleader, and played/sung on many others as a session musician. She has also featured with the Auckland Philharmonia on more than one occasion, amongst other high-profile gigs (HRH The Queen, Nelson Mendela, President Clinton……etc.) She has performed over the years at practically every Jazz Venue in Auckland, and is a well known musical figure throughout N.Z. Julie’s teaching experience in the field of JAZZ is vast. From 2000 until December 2016 she tutored Jazz vocals/piano/keyboard harmony and combos at Massey University/NZSM. She has also been an itinerant Jazz tutor in secondary Schools since 1991. Some of her most well known students over the years include Charmaine Ford (past winner of Tui for Jazz Album of the Year) Guy Harrison, Alex Ward, Ben Fernandez (Jazz Piano) and Hollie Smith, Caitlin Smith, Allana Goldsmith and Maria O’Flaherty (Jazz Vocals)- amongst many others. Julie has also been teaching students privately in her own home since the mid-1980’s, and funded her first (Classical) degree as a teenager with Classical piano students. 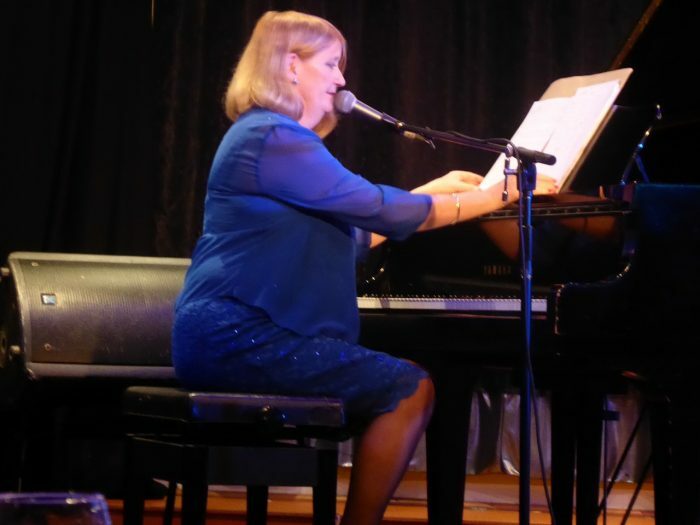 She has also vast experience as a professional repetiteur/accompanist, including too many “Stars” to mention in full….Tina Cross, Suzanne Lynch (The Chicks), Jackie Clarke, Frankie Stevens, Ray Woolf and many others. She teaches both piano and singing FROM THE PIANO, which makes it a great deal easier, particularly for singing students. She also holds “House Concerts” for her students from time to time, and encourages more advanced Jazz students to perform on her own gigs around Auckland. Some of her past private students have even released their own albums, such as Briar Ross (several) and Jack Lau. Julie travelled to Europe in 2017 with her husband, fellow Jazz Pianist Phil Broadhurst, where they based themselves for a year in Paris. Although their performing opportunities weren’t as prolific as they would have liked, they got to hear many of the world’s greatest living Jazz musicians, both at huge Jazz festivals such as the North Sea Jazzfest, but also in intimate clubs. Julie’s teaching style has evolved over countless years of teaching in both the tertiary and secondary school sectors. Her aim is to get her students playing/singing songs from the start, and incorporates technical and theory issues as they arise.